Khaosan Road Accommodation Guide for your next stay! Once upon a time, Khaosan road was a sleepy backpacker haunt. There were only budget Khaosan road accommodation and not much else. But with the dawn of plentiful and cheap travel tickets, things have changed. Always evolving, the Khaosan area has now transformed itself into a trendy hangout. Now, foreign tourists mingle with local expats and Thais on a night out. But another thing remains: Khaosan’s popular reputation as a place to stay. In the span of a few decades, Khaosan road accommodation has dramatically grown. If they started as family-run guesthouses with just the basics to international-grade offerings. While independent guesthouses remain in business, a new player is shaking up the scene. 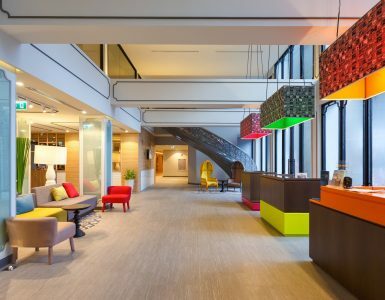 Once the Viengtai hotel was renovated into ibis Styles Bangkok Khaosan Viengtai, it was time to experience the area’s first international chain hotel. Guests can enjoy fresh design, ample space and all the amenities needed. 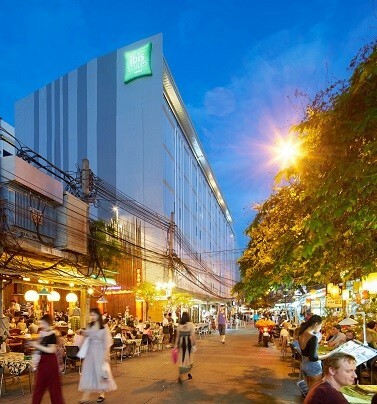 This way, guests can stay with peace of mind in one of Bangkok’s most charming neighborhoods. Food is a vital part of a fun holiday. You want to try all the intriguing local food, sweet and savoury. Starting in this part of Bangkok is a foodie’s heaven! Not only can you chow down on authentic bites, you have many international options. Need something to wash it down? Try traditional Thai tea, fresh blended fruit shakes and more! Pad Thai: You can’t come to Bangkok without having some! Many streetside vendors offer their version, or you can go fancy and try the Lobster pad Thai at Streats. Fresh fruit: Thailand has delicious and cheap fresh tropical fruit all year round. Make the most of your stay to try as many as you can! Rice porridge: Not just a breakfast staple, it’s a favourite dish for late-night party people. Follow the crowds and let its mellow flavours soothe you. Noodle soup: Choose your noodle style and the condiments! Every shop offers a different bowl of this classic Thai dish. 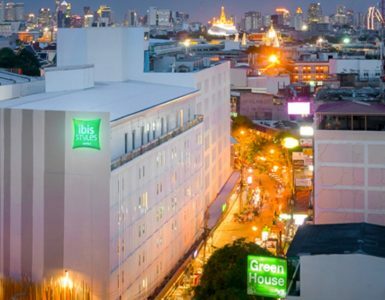 The ibis Styles Bangkok Khaosan Viengtai is located on Rambuttri Road. 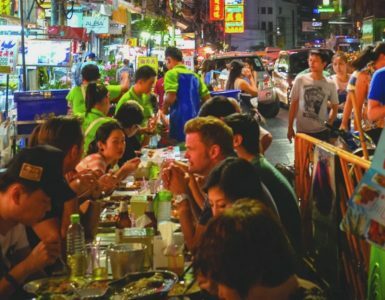 Conveniently just one street across from Khao San, visitors are able to be part of the famous nightlife but still have their peace and quiet. Local eateries, massage shops and quaint cafes abound. The hotel’s careful update further combines the old charm of Viengtai with the modernity of ibis Styles. The various rooms cater to different guest configurations and maintain a boutique feel. Highlights for any stay include the 28 meter-long rainbow pool, along with the trio combo of Streats Cafe, Bakery & Bar. There are even meeting rooms, for those business needs that sometimes pop up. On holiday, your room should be a place of calm. It’s the place to rest and recharge after a busy day or a wild night. That’s why picking the perfect Khaosan road accommodation is vital. At ibis Styles Bangkok Khaosan Viengtai, every detail aims to create a restful experience. Double-glazed windows keep bothersome sound at bay. Sink into the comfort of the famed ibis SweetBed and wake refreshed. The cheerful colors of the headboard and accent pieces mean it’s not just another boring hotel room. Hungry but don’t want to leave the room? The hotel offers a QR-code based in room delivery for popular dishes, too. Say goodbye to the idea that hotel-based restaurants are expensive or boring. At Streats Bangkok, fabulous flavours that don’t break the bank are the star. Guests can enjoy their daily buffet breakfast at Streats Café. It’s decorated in a warm and chic retro living room style for diners to feel at ease. Streats Bar & Bistro offers a la carte dining and drinks with an al fresco feeling. Open from 8 am til midnight, it’s worth a visit during multiple times of the day! Come in the evenings for live music, 6 days a week! But if it’s pastries you are craving, visit Streats Bakery! Enjoy croissants, bread and more baked fresh, daily! You can even order sandwiches and salads to enjoy with hot coffee. Need a more permanent reminder of your holiday? Grab a unique one-of-a-kind tote bag available only at the hotel. Start your night at Streats Bar & Bistro, then get ready to explore Bangkok by night! There’s nightlife for every style. Seeking rooftops? You don’t even have to go all the way into downtown, as there are a few around. What calls out to most revelers are the casual bars and drinking-holes here. Sit by the curb and people-watch the characters that often visit Khaosan. If serious clubbing is more your thing, there are pumping clubs moments away. Or, keep it classy with some jazz clubs. Bangkok’s nightlife has never been more exciting! Discover the rest of Bangkok at your leisure. Spend time by the riverside exploring the many attractions there. There are a few piers nearby. You can even take the river boats into Bangkok city proper. The nearest BTS or MRT stations are only a short ride away. From there, it’s easy to reach Bangkok’s famed shopping and entertainment areas. If your planned trip takes you beyond Bangkok, you’re in the right spot! Travelling onward from your Khaosan road accommodation is a breeze. Multiple tour buses leave from Khaosan daily. The exciting destinations range from the islands to neighboring countries. In summary? 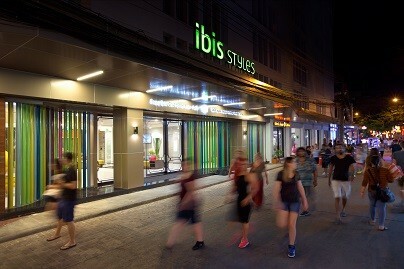 This ibis Bangkok hotel is a major leap forward for the area being one of Asia’s trendiest tourist zones. Come experience it yourself today!